Current students enrolled in a degree or certificate program at Carey may order official Johns Hopkins Carey Business School business cards from Webb Mason, our approved vendor. 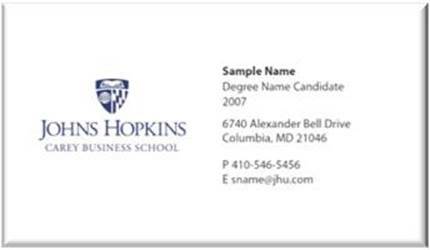 All business cards have the Johns Hopkins University and Carey Business School name in official typeset. Ordering business cards from another vendor using the Johns Hopkins University or Carey Business School name and/or logo is not permitted. All cards must indicate that you are a degree candidate. We strongly suggest that you use the following naming convention if you want to use a nickname on the card, as all academic records (including transcript and diploma) will show your given name. Business card ordering instructions are available here. You will pay the vendor directly when you place your order. All full-time MBA students will receive a badge from the Academic Program office within the first few weeks of starting school. All full-time MS students will receive an email from the Academic Programs office with details on how to request a name badge. All part-time students enrolled in a degree or certificate program at Carey may order official Johns Hopkins Carey Business School name badges from Webb Mason, our approved vendor. All name badges have the Johns Hopkins University and Carey Business School name in official typeset. Ordering name badges from another vendor using the Johns Hopkins University of Carey Business School name and/or logo is not permitted. All badges must indicate that you are a degree candidate and list your program and expected completion year. Name badge ordering instructions are included on the above link with Business Card instructions. You will pay the vendor directly when you place your order.